All-on-4™ method is an innovative concept of rehabilitation which helps toothless patients get new, fixed teeth, that looks and functions just like natural teeth, in one day and without bone transplant. Dental implants are the best solution in the case tooth loss, but in some cases a significant deficit in bone mass where the implant should be, requires a time-consuming and costly procedure of bone transplant first. For those patients dr Paulo Malo – the founder of MALO CLINIC – created All-on-4™ method, which is based on precise placing of four implants, designed to be used even for patients with substantial bone loss. A bridge with full arch of teeth is fixed to the implants on the day of the procedure. 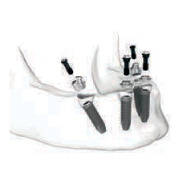 All-on-4™ procedure can be used to fully reconstruct maxillary and/or mandibular teeth arch. Thanks to the All-on-4™ method you can have beautiful, new teeth right after a visit in our clinic – this also applies to people, who received a diagnosis, stating that they cannot have traditional implants without going through a bone transplant procedure first, due to a substantial loss of bone. there was no effective treatment options. An immediate, fully functional and aesthetic bridge is fixed on the day of the surgical procedure. During the first visit at MALO CLINIC Warsaw a specialist will assess the state of your oral cavity. During the visit we will present you with the optimal way of treatment tailored to your situation. We will take your personal expectations under consideration and we will answer all the questions you might have. The basic test done during the visit is Radiological imaging (pantomography and computer tomography). The test is done in our clinic. Patients get to MALO CLINIC Warsaw looking for an alternative for the currently used bridges and dentures, which do not meet their expectations. Patients are often informed in other clinics, that due to the insufficient bone mass, implants are not possible in their case and they come to us expecting an advanced, quicker treatment without the necessity of going through additional procedures, in particular bone transplants. If the Malo Clinic Protocol method (with the All-on-4™ surgical procedure) is for you, the doctor will discuss the course of treatment and set out a schedule for the next visits. Patient’s counselor will check available dates for the procedure, you will be appointed and informed about payment methods. Additionally MALO CLINIC offers an option of payment in installments. Patients have a few options depending on the proposed treatment. 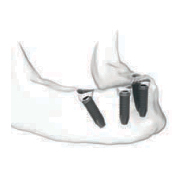 The day of the procedure will be divided into two parts: first – surgical, involving placing usually 4 implants (All-on-4™ method) and second – prosthetic, in which the Malo Clinic Bridge will be fixed to the implants. To ensure the highest quality of the proposed solutions, your new fixed bridge will be made in a denture laboratory on-site, which is why you will leave our clinic with new teeth after just one procedure day, and the implants will allow you to eat, speak and present a beautiful smile right after their placement. What is a fixed MALO CLINIC Bridge? 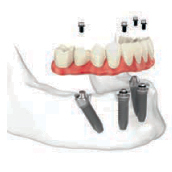 MALO CLINIC Bridge was created by MALO CLINIC specialists and it represents the highest quality based on the CAD/CAM NobelProcera™ technology. This allows us to offer you a fixed solution, characterized by its functionality and aesthetics. Thanks to using only the highest quality of materials such as titanium, porcelain or acrylic, the MALO CLINIC Bridge allows not only for the reconstruction of teeth, but also the rehabilitation of soft tissues – gums and all of the masticatory system. 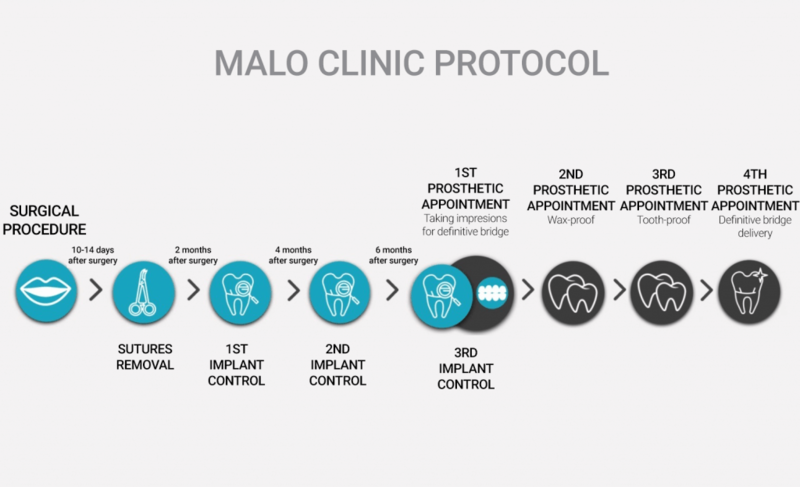 MALO CLINIC Bridge ideally simulates natural teeth, significantly improves pronunciation and chewing functions, and on top of that it is easy to clean, which means you won’t have any problem with maintaining an appropriate hygiene. Due to its aesthetic qualities and a high level of technical advancement, the MALO CLINIC Bridge is internationally recognized as a perfect fixed denture for rehabilitating toothless patients. How will your visits after the procedure look like?